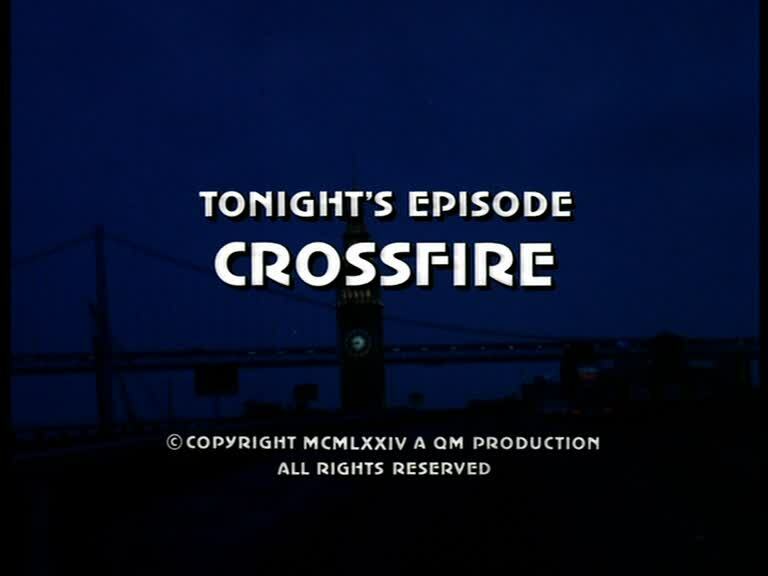 I have just added the screencaps for Crossfire to the episodes' page. Following a shooting at the University's campus, in which a female student, Penny Dunnigan, suffers a flesh wound in the arm and a renowned professor is killed, Stone and Keller are investigating what initially seems to be the act of a madman. However, their investigations uncover a different perspective when they learn the killed professor has had an affair with the wounded female student, and everything seems to be anything but coincidental. While the wealthy widow, Mrs. Shaninger, quite convincingly assures she did not know anything about her husband's alternate life (which is supported by her sister-in-law), something seems to be misleading. Another aspect turns up when Peggy reveals that the had just broken up with the professor and was going to marry a P.O.W. out of Vietnam who is currently treated in a San Diego military hospital. Balistics find out that the assassin used an M-16 military rifle, so Steve is going to San Diego in order to check the facts on Peggy's fiancé, Marine Corps Captain Alan Melder. Back from southern California, Steve knows they can scratch Melder from their list. With another shooting at the campus and a certain detail Mike remembers after Steve had reported of his first talk to Mrs. Shaninger, their investigations are concentrating on the widow who - as it turns out - has contracted a psychic unstable patient who used to see the professor about his mental illness and is now on the run. Filming for this episode centers on quite a few locations. The shootings take place at the University of San Francisco campus which is located on Fulton Street. The secret Shaninger/Dunnigan apartment (where Peggy is finally held under police observation) is the condos complex at 2200 Pacific Avenue. Mike and Steve are leaving the Coroner's Office at the SFPD headquarters on Bryant Street, whereas the alleged San Diego Military Hospital scenes are actually showing the Laguna Honda Hospital complex. Upon Steve's return from San Diego, Mike picks him up at the Downtown Airlines Terminal that used to be located at 375 O'Farrell Street (demolished, but those familiar with the surroundings will immediately note the rental car park on the other side of the road which is still existing). The climax takes us to San Francisco International Airport, where Peggy picks up Alan Melder, and Steve finally books the sniper on the main buildings' rooftop before the latter commits suicide.